So you need to make a PowerPoint presentation, for work or for an interview, perhaps. Everything is ready and you are good to start work. But, before you reach for your computer and start to make your presentation there are some tips that could be useful. Here are five simple PowerPoint presentation tips to help you get the most from your next PowerPoint presentation. Don’t forget the basics. Your presenting role is to entertain, motivate, inspire, persuade, cajole or inform your audience. Therefore, if the PowerPoint presentation software gets in the way of your main role, don’t use it. Go light on the bullet points. Bullet lists should summarise–in one, two or three words per bullet–each of the points you want to make in your presentation. Because, when you fill each bullet point with words, you can exhaust your audience. This Coats PowerPoint presentation makes this exhausting point. So, all you need are a few bullet points. Go easy on the data. Yes, you have to show how you reach a conclusion or a recommendation. But you don’t need to show all the data. That’s because a deluge of data projected on to the back wall of the meeting room is just not going to be read. Your presentation audience wants to scan for trends. And since they seek anomalies, they want to know causes. Use only one word where two might do. Thus you can keep your presentation material succinct, readable and indicative of your main points. That’s so your audience can take it all in. PowerPoint supports superb graphics, image display and video. So use them instead of words on the screen. Don’t read the slides. If you do, then it shows that you are using the slides as a crutch. Also, if you read from the screen, then you miss eye contact with your audience. Plus, you run the risk of blocking the audience’s view. Worst of all, reading your slides suggests that you don’t know your own presentation material. As a final point, audiences respect expertise and authority in their presenters. Because, when you read your slides, then you suggest neither. Some simple techniques showing you how to make a PowerPoint presentation work for you.. Remember the basics, particularly your reason to present. Go easy on the bullet points as not too many is best. Don’t include too much data, but remember explanation and good analysis instead. Use one word where you might be tempted with two. Don’t read your slides as you want eye contact with your audience. 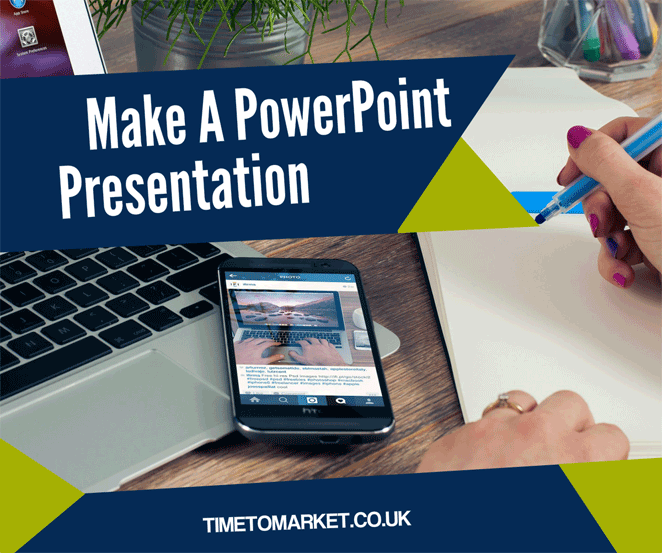 To find out how you can make a PowerPoint presentation at your nearest PresentPerfectTM training centre you can call or email training@timetomarket.co.uk.